If you are looking for a fun and festive idea for a birthday party, a Hawaiian birthday cake can be a great choice. Whether you are planning a birthday celebration for a youngster or an adult, a Hawaiian cake can be fun and delicious for everyone. There are many different ways to make a Hawaiian birthday cake. You can easily decorate a standard yellow or chocolate cake it with a colorful Hawaiian theme. Alternately, if the honoree enjoys non-traditional birthday cakes, you can select a tasty tropical treat that looks and tastes like it came straight from the Aloha state. It can be easy to dress up a standard sheet or layer cake to coordinate with a Hawaiian theme. White buttercream or whipped cream frosting makes a perfect backdrop for colorful adornments. There are many ways to create Hawaiian cake decorations with frosting, including tropical paradise beach scenes, flowers such as hibiscus and orchids, and many others. You can also find Hawaiian themed cake decorations at your local party supply store, such as plastic hula dancer figurines, tiny orchid bouquets, and other items that symbolize the Aloha state. Looking at pictures of cakes decorated in a Hawaiian theme can be a great way to come up with your own ideas. Coolest Birthday Cakes is in excellent resource for cake decorating inspiration. 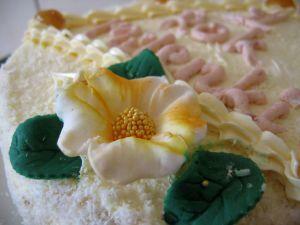 There are many types of creative luau cakes and hula dancer cakes displayed on the site. If you want to really have a memorable Hawaiian birthday bash, you might want to consider selecting a cake that is Hawaiian in flavor as well as appearance. If the theme of your party is a luau and much of the food is tropical in nature, it makes sense to have a tropical cake as well. There are many different types of tropical dessert treats that can make a perfect birthday Hawaiian theme birthday cake. One of the most tasty tropical desserts is a coconut cake. Coconut cakes are delicious and easy to make. They are a great option for people whose decorating skills aren't advanced, as they don't really require any complicated decorations in order to look scrumptious and tropical. To make a coconut cake, you should start with two round yellow or white cakes that are the same size. You can use a packaged mix or your favorite from-scratch recipe. Once the cakes have cooled, place one of the layers on a serving tray and cover the sides and tops with buttercream frosting. Sprinkle shredded coconut on the top and sides before the frosting gets hard. Put the second layer on top of the first layer cake and cover it with frosting and coconut. You can stop there, or add some colorful decorations and birthday candles. Like coconuts, pineapples are frequently associated with Hawaii. There are a number of different cake recipes that feature this delicious tropical fruit. One of the most popular is the pineapple upside down cake. Like the coconut cake, the pineapple upside down cake is a great option for those who don't want to spend time or money on cake decorations. The cake is so festive in appearance by itself that embellishment really isn't necessary.There are many different recipes for creating pineapple upside down cakes. You can even purchase packaged mixes for this type of cake in most supermarkets. The most basic way to make a pineapple upside down cake is to place canned pineapple rings along the bottom of a sheet cake pan, put maraschino cherries in the center of the pineapple rings, pour a yellow cake mix over the fruit, and bake. When you decide to go with a Hawaiian birthday cake, you might just want to go all out with the theme and have a full-fledged luau bash. In addition to the cake, guests can enjoy a wide variety of tropical treats that will be sure to make the party an event to remember.